When you stay at Odalys Résidence Saint Loup in Cap d'Agde, you'll be near the beach, within a 10-minute drive of Cap d'Agde Beach and Fort de Brescou. Free self parking is available onsite. Located in Pierre-Buffiere, Auberge Dupuytren is within a 15-minute drive of Chateau de Chalucet and L'Aquapolis. The front desk is staffed during limited hours. 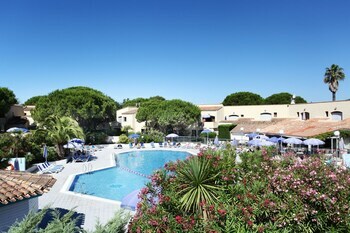 When you stay at Bastide Fauvette in La Ciotat, you'll be near the beach and 4 minutes by foot from La Ciotat Harbour. When you stay at Hôtel le Sire de Joux in Montbenoit, you'll be 14 minutes by car from Farm Museum. Free self parking is available onsite.